I always thought the place where you have to spent most of your day must be somewhat inspiring. After eleven years sitting in the same spot with co-workers around me, I found peace working at home without no co-workers around me. My desk is far from a DIY project, but we did make our own design with the furniture of the oh-so awesome IKEA. So, as usual for the DIY Workspots, I found a great one today to share with you. 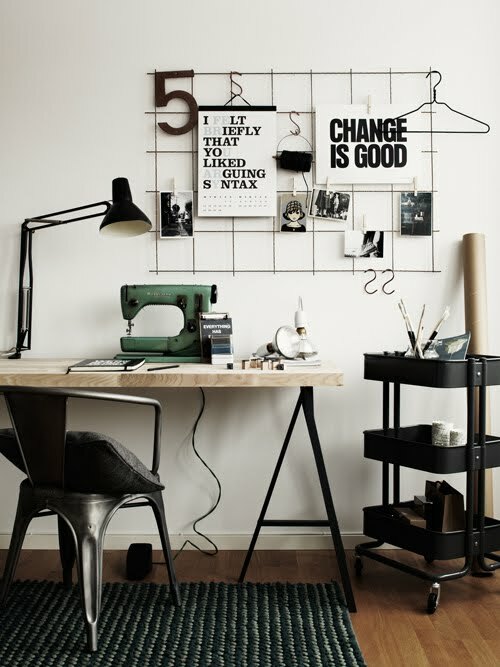 This is a simple desk and an easy to make iron mess board. The mess board is the easiest to do, as you just have to buy a gridwall from your local hardware and paint it with your desired paint color. You can cut it to the size that you would love to have. The desk is also something very simple. You can buy those table legs at IKEA and to get a bit of a sturdy look, you can add a butcher block kitchen top or a plane and simple door. Here they kept a industrial kind of look with the color black and metal pieces. How do you like this workspot? Would you feel inspired to work here? I wish I could have a home office. This work spot looks lovely.